Doreen Fletcher - Looking back, I suppose I was very spoiled. From a young age I liked painting and my dad used to take me to the toy shop and we had to buy the best, most expensive paints. I was an only child, born into a working class family, and my parents, Colin & Alice, were semi-literate, I guess you would say. I was a bit of a loner, I liked going for long walks. I passed the eleven-plus but I had a very difficult time at Grammar School because, although I was clever, I came from the wrong side of the tracks. I used to have to wear this hat and every morning, as I was walking to school, the Secondary Modern kids would come and knock it off my head. When I got to school, I had to pretend I was from somewhere else, because all the other kids they came from families who were doctors, solicitors, and so I felt, you know… odd. The Gentle Author - What was the first landscape that you knew? Doreen Fletcher - It was grey. Grey, brown streets with sparrows, lots of sparrows and pigeons. I used to long for colour. I grew up in a two-up, two-down terrace in Stoke-on-Trent, but every Sunday my parents used to take me on a bus into the country and I just loved colour. I remember, when I was five, I was bought a set of encyclopaedias from the guy who came round knocking on street doors and it had colour pictures in it – paintings – and I thought they were wonderful. And I suppose that was when I started to be interested in visual things – plus at Grammar School, when we were doing Art, I did not have to talk and my accent in those days was quite broad. All the other girls spoke with posh accents, so I would paint in silence and it was something I was good at, so I got praise for that. The Gentle Author - What work did your parents do? Doreen Fletcher - Oh Alice, my mother, she was a servant. She worked in a munitions factory during the war and then she became a servant afterwards. It gave her ideas about not having the newspaper on the table and no tomato ketchup, and healthy eating. So in her case, there was a slight social mobility. She was very very fussy about the front step being clean. Colin, my dad, started off as a farm worker, he had wanted to be a vet but the fact that he did not like school – could hardly read or write – stood in the way. After I was born, they moved to the town because he could earn more money and, in the late fifties, when they started putting up pylons he worked on that, and then later he worked putting in pipes for North Sea Gas too. When he was fifty-seven, he had a brain haemorrhage when he was working, probably because of the pneumatic drills, and he did not work again after that. The Gentle Author - So what took you away from the Potteries? Doreen Fletcher – I did not like living in a small town. I hated the constrictions and the pettiness. I wanted to go to Art School in London, and I met a boy who got a place in one and I moved with him to London. The Gentle Author- But did you apply to Art School yourself? Doreen Fletcher – Yes, I did a Foundation Course in Newcastle but after that I became a model. I did that for a long time. The Gentle Author - Where did you live when you came to London? 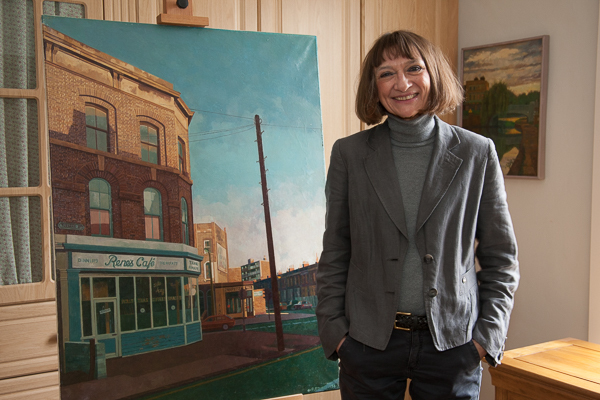 Doreen Fletcher – I moved to Colliers Wood in South West London and I got a job at an Art School as a model. Gradually, I started taking photographs and doing drawings but – at that point – I did not really know what I wanted to paint, except that it was almost a compulsive activity. I did quite a lot of self portraits and still lives. It was only when I moved to Bayswater in 1976 that I developed a strong interest in urban landscape. For me, it was a very exciting place to be – having come from this small town – and it was close to the Serpentine Gallery, Kensington Gardens, Notting Hill Gate and Portobello Rd. 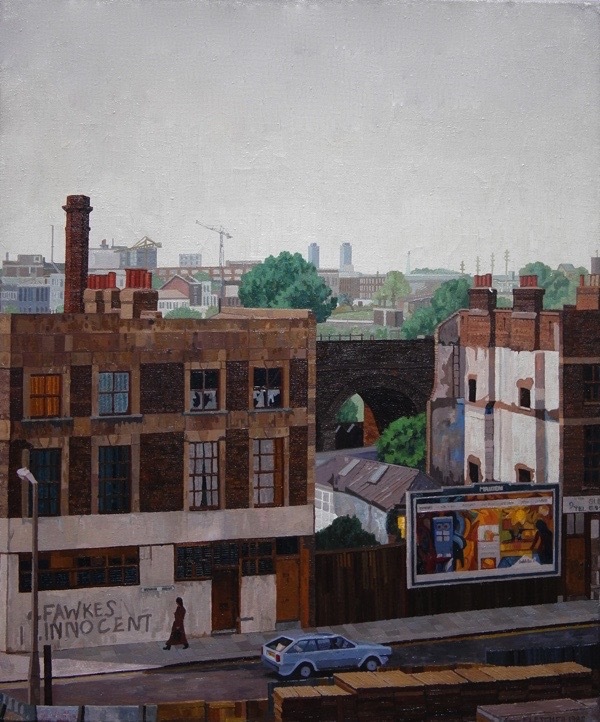 I started painting the local streets – the Electric Cinema, the Serpentine Boathouse – and then I became interested in Underground stations at night – Bayswater, Paddington – and this continued when I moved to the East End. The Gentle Author - What brought you to the East End? Doreen Fletcher - Simply that the relationship I was in broke up and I met someone new and the housing was cheap in the East End. It was relatively cheap to rent at that time because lots of people were moving away, so artists were still moving in to places like Bow and Mile End. The Gentle Author – How do you remember the East End as it was then? Doreen Fletcher – There was corrugated iron everywhere! I loved it here because I had had enough of the sophistication of the West End. It seemed to me like coming back home here – lots of corner shops and tiny pubs. There was a community but, after a couple of years, I realised that they were not staying, and the corner shops and pubs were closing. The Gentle Author - Why did you start painting the East End? Doreen Fletcher – I was visually excited by being somewhere new. 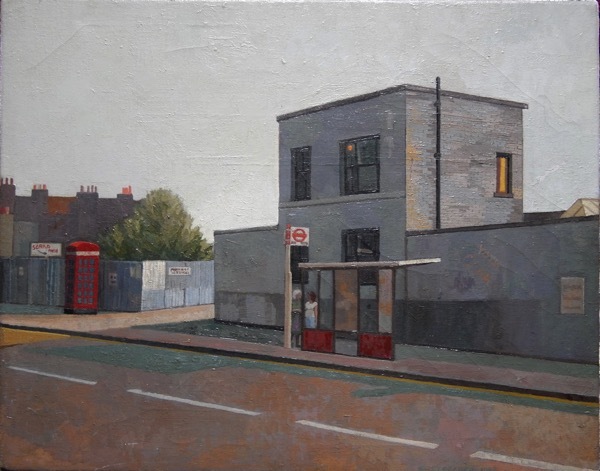 The first painting I did in the East End was the bus stop in Mile End in 1983, and then I think I did Renee’s Café next. Once I realised they were going, it triggered this idea of painting the pubs and the shops. The Gentle Author – Was this your full time occupation? Doreen Fletcher – No, I was working as a model. It was the most boring job you could imagine but I just stuck at it during term time, so I would have periods of full-time painting and I could keep myself by working three days a week as model. The Gentle Author - How central to your life were your paintings at that time? Doreen Fletcher – Very. That was my focal point. My studio was a small room at the top of a run-down three-storey house in Clements St. It faced north so the lighting was good in the day time. I spent a lot of time just walking around at all times of day and in different weather conditions. Eventually a specific scene imprinted itself on my mind which I felt could have potential as a painting. I would make thumbnail sketches sketches on the spot and take a picture with my camera. Once I had gathered as much information as I could, I would make a highly detailed drawing which acted as a basis for the painting. This might evolve gradually over a period of months or even years, as a tension built up between my need to represent reality and the demands made by the painting itself. I always struggled to resolve it in an abstract and objective way as well as recording a recognisable subject. I used to try and work twenty-eight hours a week, I never wanted to become a Sunday painter. The Gentle Author - Did you have ambition for this work? Doreen Fletcher – Yes and I did have some limited success in the eighties. I had a show at Spitalfields Health Centre on Brick Lane and then at Tower Hamlets Library in Bancroft Rd. Local people loved my paintings but there was limited interest from any critics. The Gentle Author - Did you pursue other avenues to get recognition for your work? Doreen Fletcher - Once a month, I used to send off for lots of slides in response to competitions and requests for submissions in Artists’ Newsletter but it never seemed to go anywhere. The Gentle Author - How did you maintain morale through that twenty year period? Doreen Fletcher – I have an optimistic nature and I remained optimistic up until the late nineties when my interest in the genre waned and I think it affected the quality of what I was doing. I realised I was coming to the end of the series I was doing of the East End. The Gentle Author - What told you that you were coming to the end? Doreen Fletcher - The East End was changing and I was not really interested any more. The new build made it very dense, taking away the individuality and the sense of community. At first, I was interested while it was being built – on the Isle of Dogs, for instance – but once it became functional there were just too many people. The Gentle Author - At the time you concluded the series, were there changes in your life? Doreen Fletcher – I became more involved in teaching Art to kids with special needs. I grew more interested too, because I appeared to be good at it and my work was successful. Gradually, I became involved in the tutorial side of it as well and supporting other lecturers. The Gentle Author - Did you find that rewarding? Doreen Fletcher – Yes, I was earning money from it and it was rewarding working with other people, so I became more and more involved in that. The Gentle Author - Once you had completed nearly twenty years of painting the East End, what were your feelings about that series of work? The Gentle Author - Were you disappointed? Doreen Fletcher – Yes. I remember the day I made a conscious decision to pack away my paints. It was November 16th 2004. I said, ‘That’s it!’ I am not going to paint again. The Gentle Author - Do you think your project reached its culmination? Doreen Fletcher – At the time I thought not, but looking at the work again, I am very very glad I did it now – what I think was important was that I recorded something which has gone. The Gentle Author - Do you think that you evolved as a painter by doing this work? Doreen Fletcher – I think, if I had I been taken on by a gallery, I would have developed more as a painter. Instead, I think I found a method of working that suited what I was doing and I stayed with it. Maybe with a bit more encouragement I would have done what I am doing now – since I have come back to painting – which is pushing the boundaries? The Gentle Author - Do you have a criterion for judging if one of your paintings is successful? Doreen Fletcher – Yes, a painting is successful for me when I believe I have captured a moment. Doreen Fletcher’s exhibition IN BETWEEN, ALMOST GONE opens on Friday 13th October at Townhouse, 5 Fournier St, Spitalfields and runs daily until 27th October. Catalogues are available for £5. WOW Doreen your paintings are so beautiful……………love the colours, the dark and light. Well everything about them. Doreen, your paintings are a statement of time as it was. I applaud your determination in making your work with little comeback during the 20 year period. Your recognition is now and your paintings are beautiful. Good luck in the PV tomorrow.